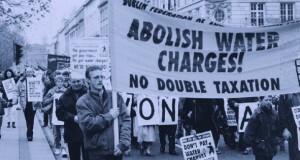 Water charges were strongly resisted throughout the country since 1983. In the end it was the intense battle waged in Dublin for three years which resulted in their abolition in 1996. There were many facets of this campaign but this article will try to outline the key lessons that can be learned and on that basis pose the tasks facing the new movement against refuse charges.